Georgia has a progressive income tax rate with six tax brackets that range from 1% up to 6%. 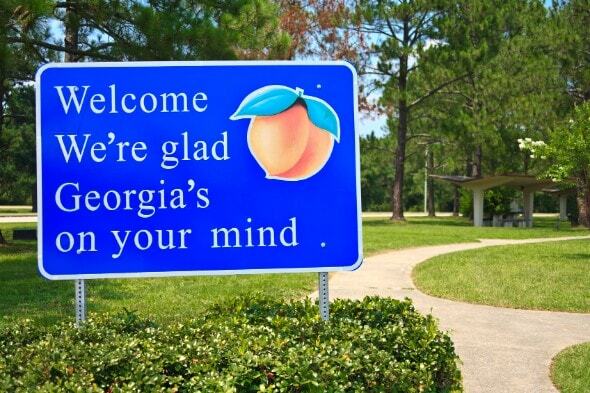 Peach State residents who make more money can expect to pay more in state (and federal) taxes. There are no local income taxes in Georgia. As is the case in every U.S. state, employers in Georgia withhold a certain amount of federal and FICA taxes from each of your paychecks to send to the IRS. The IRS puts federal taxes toward your annual income taxes, and FICA taxes go to Medicare and Social Security. Your employer withholds 1.45% of your wages for Medicare taxes and 6.2% for Social Security taxes every pay period. Your employer then matches those Medicare and Social Security taxes in order to pay the full FICA taxes, which are actually total 2.9% and 12.4%, respectively, of your wages. There is also an additional 0.9% Medicare surtax on earnings that exceed $200,000. Your employer does not match the surtax. If you’re self-employed, you have to pay the full FICA taxes on your own. Luckily, there are deductions to help you recoup some of that during tax season. The rate at which federal taxes are withheld from your paycheck depends on the information you provide on your W-4 form. Whenever you start a new job or experience a major life event like welcoming a child into your family, you will need to fill out a new W-4. Other factors that affect the taxes withheld are your marital status, how many allowances you claim on your W-4 and what pre-tax contributions you make. In December 2017, President Trump signed a new tax plan into law. The new plan changed tax withholding guidelines; you may have noticed in early 2018 that the size of your paychecks changed a bit. If you haven’t already the start of the new year is a good time to doublecheck all the information on your W-4. Have dependents? You might qualify for more allowances, which may save you more money on taxes. Does your employer offer a 401(k) plan, health savings account or flexible spending account? Contributions to any of these accounts are pre-tax, so they come out of your paycheck before income tax is removed. That means you could lower your taxable income by putting money into these accounts. All of the above options above can help you lower the taxes you pay. However, keep in mind that if you claim too many allowances or otherwise don’t pay enough during the year, you could find yourself with a big bill come tax season. If you underpay your taxes by more than $1,000 you will also have to pay a penalty. If you file as a single person or separately from your spouse in Georgia, you will get taxed 1% if your taxable income falls under $750. If you earn up to $2,250, then you’ll be taxed 2% on income between $750 and $2,250. The marginal rate rises to 3% on income between $2,250 and $3,750; 4% on income between $3,750 and $5,250; 5% up to $7,000; and then all income above $7,000 is taxed at 6%. For married couples who file jointly, the tax rates are the same but the income brackets are higher, at 1% on your first $1,000 and at 6% if your combined income is over $10,000. If you were slapped with a huge tax bill or received a big lump sum refund during tax season, you may want to make adjustments to your tax withholding. Having to pay a tax bill in April could strain your budget; and while a big refund seems great, you could have had that money earning interest in a savings account all year. One easy way to withhold more taxes is to ask your employer to do so. Simply write on the appropriate line of your W-4 a dollar amount that you want taken out of each paycheck. Want $10 taken out every time? Write that down. It might seem like you’re going to be getting smaller paychecks, but you’re simply paying the taxes you owe in advance, so you won’t be surprised with a large tax bill later. Another way to change your withholding is to modify your allowances. A life change, such as marriage, divorce, purchasing new property or the birth of a child, can affect how much is taken out of your paycheck. To get a more accurate estimate of your taxes, experiment with the paycheck calculator to see how different scenarios will affect your take-home pay. Adjusting your pre-tax contributions can also affect how much taxes are withheld. Pre-tax contributions change how much taxable income you have because they come out of your wages before income tax is removed. Pre-tax accounts include flexible spending accounts, health savings accounts, commuter benefits program and retirement accounts such as a 401(k) or 403(b). Thinking of buying a home in Georgia? Now that you’ve learned all about the state’s income tax, head over to our Georgia mortgage guide. There you can learn more about rates and getting a mortgage in the Peach State.